In the previous Q-A Paper (#87) it was stated that each primordial cell develops its mind and memory which is then carried vibrationally “down” in the process of cellular materialization where the cells become more specialized serving within the aggregate of an specializing conscious organ of an differentiating and evolving body system. During the process of cellular and organism mater-realization the cells gradually aggregate into more specialized systems. In humans we see the original PUMA vortex central/axial lines of forces segregated into the materialized energy systems of different functionality. 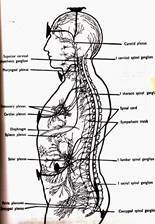 In the skeletal body system, for instance, these lines of force form the centrally positioned vertebral column (2A) enclosing the spinal column of the central nervous system (2B). In the circulatory system these lines of force become the aorta and vena cava of the central circulatory system (2C) etc. Upon the body cell degeneration and death, the soul/solar energy withdraws from its dying physical body (sthula) and its “etheric double” into its higher energy astral (kama), mental (manas) bodies etc. Through this process the actualized PUMA body axial lines of force and their chakras are seen as gradually aligning back to their central positions. 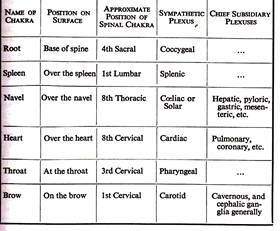 In the below “etheric-double” body (Picture 3A) the chakras are still off central/axial alignement. Etheric-double chakras and their corresponding vortex lines of force with their peripheral vortex wheels are presented below in Pictures 3 A-C. This subject will be discussed in more details in the future Papers and Q-A Papers posted on www.Lighttoparadise.com .